WITHIN TEMPTATION - the leaders of dark anthems, with a career spanning two decades - have signed a worldwide deal with Universal Music Germany. The band is partnering with Spinefarm Records for North America and the UK. "With this record, we've taken inspiration from modern music and gave it a face - a very dark one," said singer Sharon den Adel. "Sometimes, it feels that today's pop music lacks a rebellious edge. Our main goal was to collect pieces from sounds we did like and roughen it up as much as we could, resulting in a surprisingly new musical world that is heavier, dirtier and more futuristic than we've ever created before. 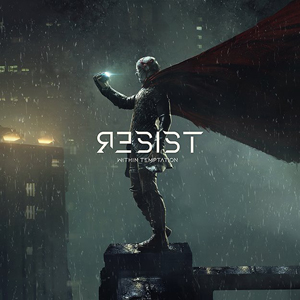 Resist is our take on metal in a new way: to give modern music its rebellious edge." The new sound of Resist cuts through bombastic first single "The Reckoning", featuring Jacoby Shaddix of PAPA ROACH. Listen below. With 6 studio albums under their belt - Enter , Mother Earth , The Silent Force , The Heart of Everything , The Unforgiving , and Hydra  - and more than 3.5 million record sales to their name, WITHIN TEMPTATION - led by the aforementioned den Adel and Robert Westerholt - are a force to be reckoned with; one of the world's most successful heavy rock groups. den Adel further said, "We are beyond excited to have signed to the biggest record label! Bundling our strength together with such a renewing and thriving force in the music industry, we are sure that we can make magic happen." WITHIN TEMPTATION have previously headlined all the major festivals in Europe - Download, Hellfest, Wacken Open Air, Graspop, and Woodstock Poland, as well as many other events. WITHIN TEMPTATION have received numerous international awards, including a World Music Award, MTV Europe Music Awards, a Metal Hammer Award, and many more. WITHIN TEMPTATION's 2014 album Hydra reached the top 10 of the album charts in ten countries. With #16 on the American Billboard chart, it was their most successful US-release to date and subsequently presented live by the band on a sold-out US-tour. The band's European tour kicks off in October and consists of 35 dates in 18 countries. More dates around the globe will follow in 2019.